Zuane Antonio Canal, Venetian painter, the son of Bernardo Canal, a well-known scenery painter at the time. 'Canaletto'  or small canal  as he was soon called, received his training in the studio of his father and his brother, with whom he continued to collaborate for several years. He became the most famous view-painter of the 18th century.He began his career as a theatrical scene painter (his father's profession), but he turned to topography during a visit to Rome in 1719-20, when he was influenced by the work of Giovanni Paolo Pannini. In Rome, in his own words, 'irritated by the immodesty of the playwrights, [he] formally foreswore the theatre,' to devote himself entirely to painting al naturale (from nature). It is not entirely clear what inspired him to this, but it was most likely his acquaintance with the work, and possibly also the person, of Caspar van Wittel.By 1723 he was painting picturesque views of Venice, marked by strong contrasts of light and shade and free handling, this phase of his work culminating in the splendid Stone Mason's Yard (c. 1730, National Gallery, London,). Meanwhile, partly under the influence of Luca Carlevaris, and largely in rivalry with him, Canaletto began to turn out views which were more topographically accurate, set in a higher key and with smoother, more precise handling - characteristics that mark most of his later work. At the same time he began painting the ceremonial and festival subjects which ultimately formed an important part of his work.His patrons were chiefly English collectors, for whom he sometimes produced series of views in uniform size. Conspicuous among them was Joseph Smith, a merchant, appointed British Consul in Venice in 1744. It was perhaps at his instance that Canaletto enlarged his repertory in the 1740s to include subjects from the Venetian mainland and from Rome (probably based on drawings made during his visit as a young man), and by producing numerous capricci. He also gave increased attention to the graphic arts, making a remarkable series of etchings, and many drawings in pen, and pen and wash, as independent works of art and not as preparation for paintings. Meanwhile, in his painting there was an increase in an already well-established tendency to become stylized and mechanical in handling. He often used the camera obscura as an aid to composition. In 1746 he went to England, evidently at the suggestion of Jacopo Amigoni (the War of the Austrian Succession drastically curtailed foreign travel, and Canaletto's tourist trade in Venice had dried up).For a time he was very successful painting views of London and of various country houses. Subsequently, his work became increasingly lifeless and mannered, so much so that rumours were put about, probably by rivals, that he was not in fact the famous Canaletto but an impostor. In 1755 he returned to Venice and continued active for the remainder of his life. Legends of his having amassed a fortune in Venice are disproved by the official inventory of his estate on his death. Before this, Joseph Smith had sold the major part of his paintings to George III, thus bringing into the royal collection an unrivalled group of Canaletto's paintings and drawings. 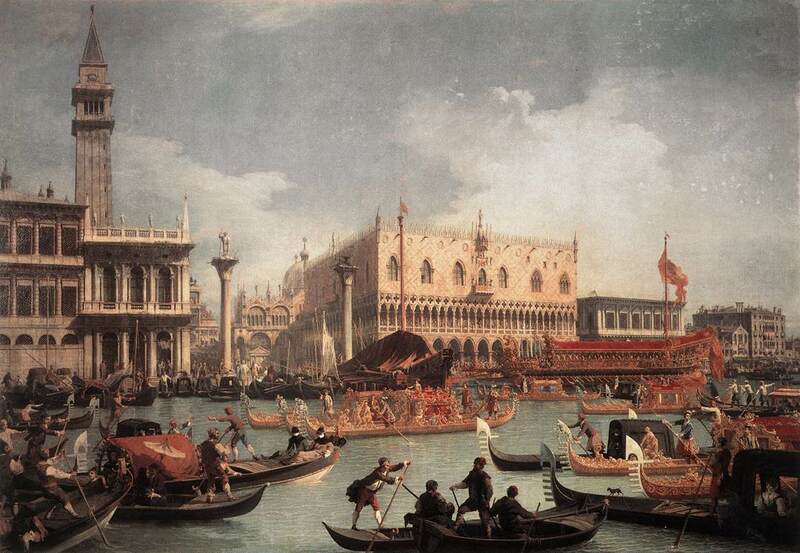 Canaletto was highly influential in Italy and elsewhere. His nephew Bernardo Bellotto took his style to Central Europe and his followers in England included William Marlow and Samuel Scott.